Multi-homing with MPTCP in test on NorNet Edge! The customized hardware is named ufoboard and it is connected to four different mobile broadband networks. The experiments are limited to unidirectional (downlink) transmission at the moment. 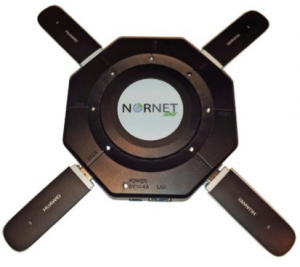 If you are working with MPTCP or you are curious about the NorNet testbed, talk to us. Stay tuned, we are working on new ideas with MPTCP and the ufoboard! This entry was posted in News by Simone Ferlin. Bookmark the permalink. Next → Next post: NNUW-1 Registration is Open Now! Get ready for the M²EC 2019!